BAM Nuttall, the leading construction and engineering company is aiming to eliminate the use of rock drills, hand breakers and scabblers on its projects by the end of the year in a significant step towards improving workforce health and welfare. 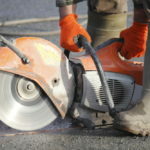 Hand-arm vibration comes from the use of hand-held power tools and is the cause of significant ill health (painful and disabling disorders of the blood vessels, nerves and joints), and is a particular source of concern in the construction industry. Advice from the HSE says that whilst HAVS (Hand Arm Vibration Syndrome) is preventable, once the damage is done it is permanent. BAM Nuttall believes that over the years people have underplayed the impact of vibrating tools on people in the industry. “Many of these tools are really from a bygone age and have been part and parcel of every day civil engineering life and as an industry we’ve been slow to develop alternatives,” says Divisional Director at BAM Nuttall, John Heffernan. “Thirty years ago, white finger was not only considered an old man’s illness but also something of a badge of honour, especially in the tunnelling industry. Nowadays that is simply not acceptable. While conceding that eliminating these tools would be very difficult, he says there needs to be a attitudinal change towards the use of vibrating tools by contractors, their workforce and manufacturers. BAM Nuttall has already successfully trialled machines that significantly reduce Hand-arm Vibration Syndrome on a number of projects. A Positioner-Actuator-Manipulator (PAM) was used on its Heathrow Airport tunnels project. While a PAM OVE carrier, that makes overhead and vertical concrete chipping and drilling easier by reducing vibrations and operator effort, was used at Chswick Bridge. Health and safety – why run the risk?